Lakeview Rewired is a community-oriented coffee shop in Chicago’s Lakeview neighborhood. It’s eclectic style, outstanding service, and community events set it apart from local competitors. Daniel, the shop owner, recently opened a new catering company focused on corporate clientele and he came to me to design print materials for the new business. Daniel asked me to design a simple and elegant business card and tri-fold menu for a tight budget (5 hours). Because the new catering company is loosely affiliated with Rewired Café, I suggested we borrow one brand color from the café but keep the remaining design clean and straightforward. I wanted to design a menu and card that could stand alone but also serve as a foundation for further work. If the catering company develops unique brand elements in the future, I want to be able to add treatments that enhance the materials without needing to make significant changes to the existing design. Off the bat, I decided to work within a number of limitations to create effective materials within the allotted time frame. I would use one simple and legible font to keep the menu and business card cohesive and readable. I also limited my design to mainly black and white for both materials, but in the end added a bold accent color I borrowed from Rewired Café. The accent color livened up the menu design significantly and tied the catering company in loosely with Daniel’s other business. The left side is the middle fold, the middle is the back, and the right is the front. I kept the front and back simple using the existing logo mark and a contact CTA. The middle fold includes simple copy so as the menu is opened the reader begins to feel the brand values and tone. As a consistent customer of the business and friend of the owner for over a year, I benefited from a good understanding of his values, mission, and needs. My relationship with the café and owner helped me create simple and brand-aligned copy. I used the brand blue to accent the values statement on the top left and call out the content type as unique. To balance this strong visual element and bring the reader back towards the task at hand, I created a simple box around “The Menu” text to call out the next step and keep the reader moving. The menu contains relatively complex information—some items were listed per person whereas others were available only at predetermined bulk increments (6, 12, 18, etc). I focused most of my time improving readability through intuitive information organization, simple copy, and strong visual hierarchy. I wanted to alot most of my time to the menu, so I chose to limit my time designing the business cards to 1 hour total. I designed the business cards using a black and white palette. I relied on font weight and size along with a couple simple style elements to inform visual hierarchy. I used various weights and sizes of Avenir Next to keep the business cards and menu coherent. By leveraging Rewired Catering’s existing logo graphic on the front of the card, I kept my time down, the card streamlined, and the focus on the CTA on the back. 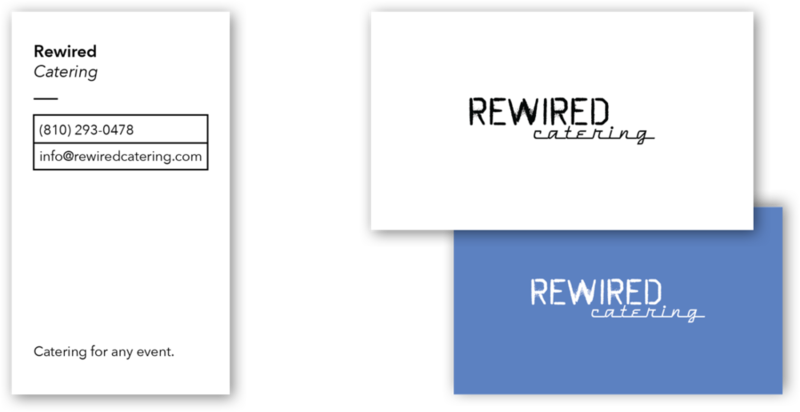 I used simple stylistic elements on the back to call out Rewired Catering’s contact information. In the end, I did return to the business cards after creating the menu and added an alternative front design using the same brand blue background and white logo mark—I know Daniel likes strong colors. I opted not to create a white font over blue background design for the back because the black on white maintains the best legibility with the smaller font size. It was an absolute pleasure designing for a business and a client with whom I have a personal relationship. I knew Daniel’s personality, his motivations, and his business goals going into the project, and I knew he trusted me to deliver a great design within the constraints. I had a lot of fun working on print and learning to design for a new form-factor. I also got to diverge from Sketch for a project and gain more experience in Adobe Illustrator. In the end, Daniel was thrilled with the deliverables. I’m hoping to convince him to work with me on designing brand elements next!